The seventh annual Dallas Art Fair, presented by Ruinart Champagne, will feature nearly 100 prominent national and international art dealers and galleries drawn from 22 cities. The fair will return from April 9 to 12 to the Fashion Industry Gallery (f.i.g. ), located at 1807 Ross Avenue in the dynamic Downtown Arts District. 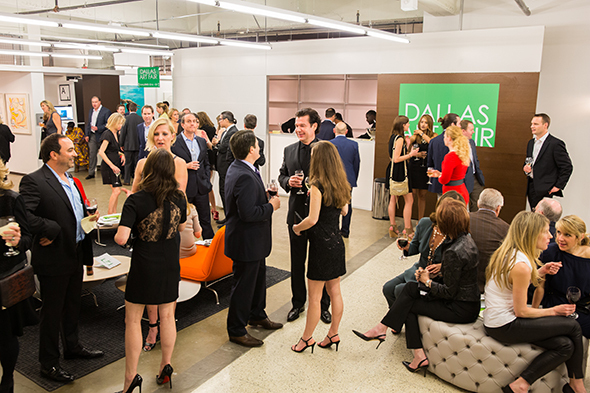 The Dallas Art Fair launches with the 2015 Preview Gala on Thursday, April 9. The preview gala benefits the Dallas Museum of Art, Nasher Sculpture Center and Dallas Contemporary, and offers art patrons and Dallas’s top collectors the opportunity to preview and purchase exhibited works prior to the public opening of the fair. The 2015 edition will once again anchor the official Dallas Art Week, highlighting the city’s leading art organizations with major exhibition openings and art-related programming. MTV RE:DEFINE returns on Friday, April 10, with a major benefit honoring iconic artist Michael Craig-Martin to support the MTV Staying Alive Foundation and the Dallas Contemporary. Coinciding with the MTV RE:DEFINE auction, gala and exhibition, The Goss-Michael Foundation will present an exhibition of ten artworks by Michael Craig-Martin placed at prominent public spaces throughout Dallas from the beginning of April through May 2015. On Saturday, April 11, the Dallas Museum of Art will celebrate Art Ball 50—the 50th anniversary of the museum’s annual gala featuring a seated dinner, live auction and festive after party. “During the week of the Dallas Art Fair, Dallas’ museum’s and institutions unite to present to collectors and the community an infinitely rich opportunity to experience the contemporary arts,” notes John Sughrue, co-founder of the Dallas Art Fair. Notable exhibitions include David Salle and Nate Lowman at Dallas Contemporary; an Ei Arakawa performance at Dallas Museum of Art; Belgian artists Harald Thys and Jos de Gruyter at The Power Station; a Claude Rutault performance presented by SOLUNA: International Music & Arts Festival; and Galerie Perrotin at the Meyerson Symphony Center.